I recently placed a some what large art supply order from Discount School Supply. If you couldn't have guessed we go through a fair amount of art supplies around here so every so often I place a larger order for things like paper and paint that I get in bulk and stock up on. I also need to mention here that I may have a slight art supply problem. I love looking through the art supply catalog as much as my kids like looking at all the holiday toy catalogs. So of course, I had to add just a few fun little things in with my order of paint and paper. These little plastic eye droppers were one of those things, they came in a back of 12 for 2.99 so the price was definitley worth the fun that we have had with them, although you could also use something like a turkey baster or even a medicine syringe. I started by pouring some liquid watercolors into a muffin tin. 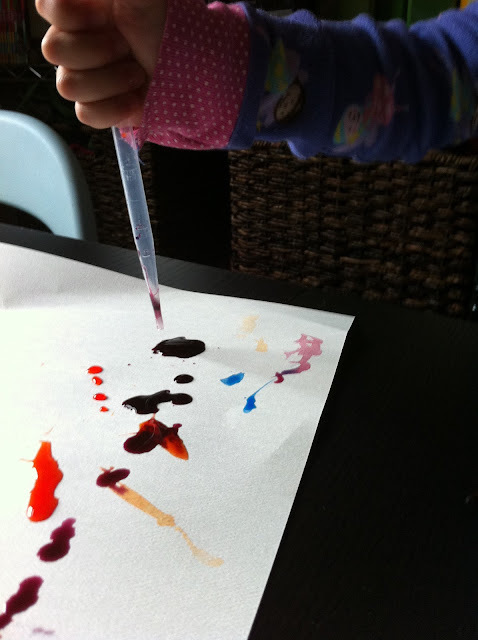 The girls then each took a piece of watercolor paper and one plastic eye dropper. I quickly showed them how they could put the color they wanted into the eye dropper and then squeeze the top bulb to see the color come up the tube. They both loved when I showed them how they could then squeeze the watercolors out onto the paper. After that they were off, filling and squeezing. 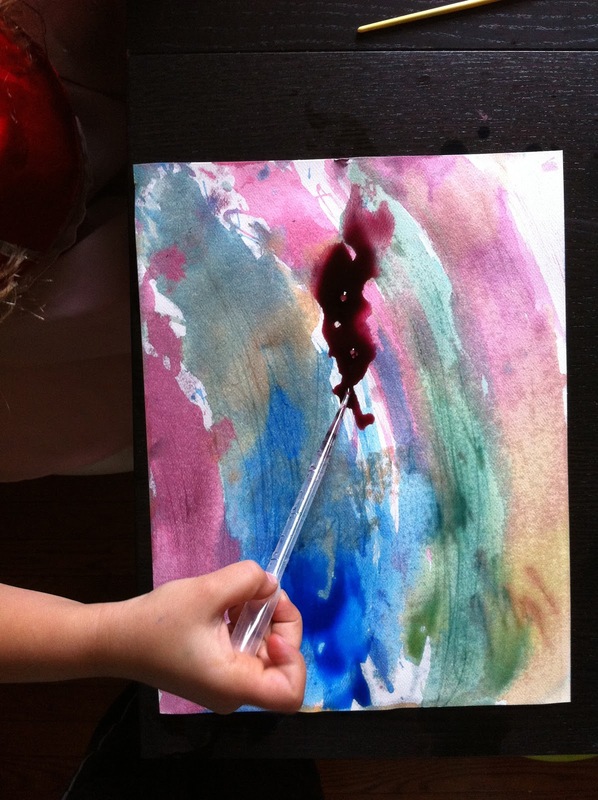 They loved squirting out the colors, watching them run together, brushing the paint around, picking up their paper and watching the paint drip. This was by no means a clean project, we all had paint on our hands and the table was a mess but it was all washable and well worth the fun and experimentation. 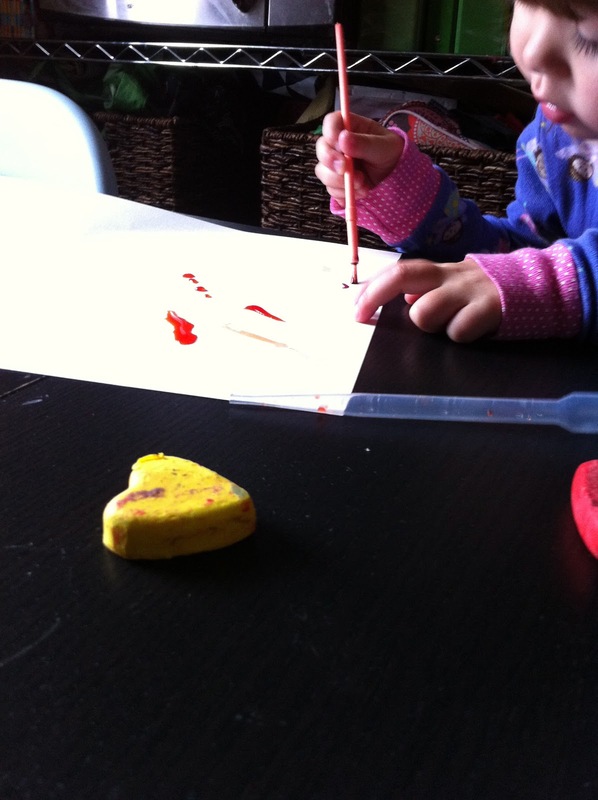 Our little eye droppers lasted the whole time, and they each made several paintings before moving on to something else and can still be used again. I think next time we will get some straws out to blow the paint around, I will let you know how it goes. I just stumbled upon your blog looking for photos of the Stadium Place Y. You have great ideas! I can't wait to try some of these activities out with my girls! And the Walters outside art thing is so cool. What a great resource your blog is! 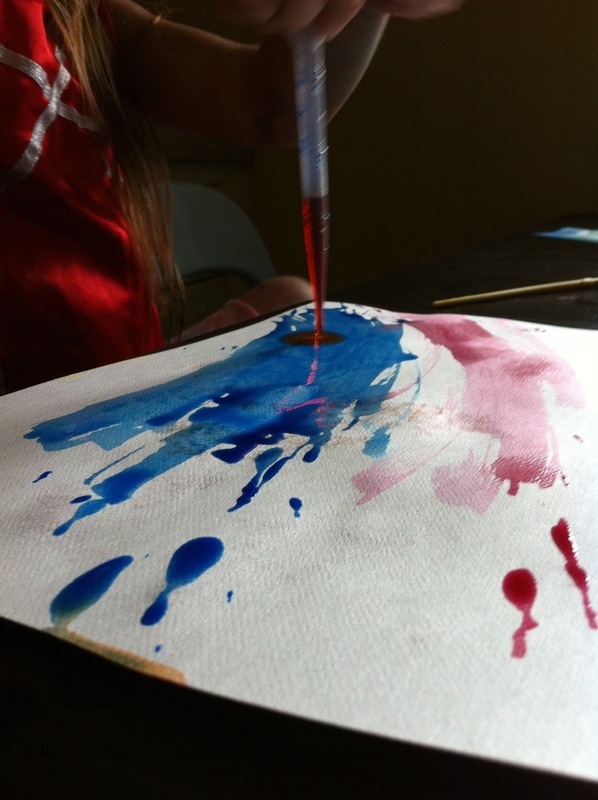 Dropper paintings are so fun! Check out these amazing dropper paints called Crosswaters: YouTube.com/ArtKitStore ... enjoy!